My Bulb energy switch is nearing the end of the quoted 21 days. 21 days is the standard time quoted by energy companies that they say a switch will take and I am just days away from being an official Bulb customer. 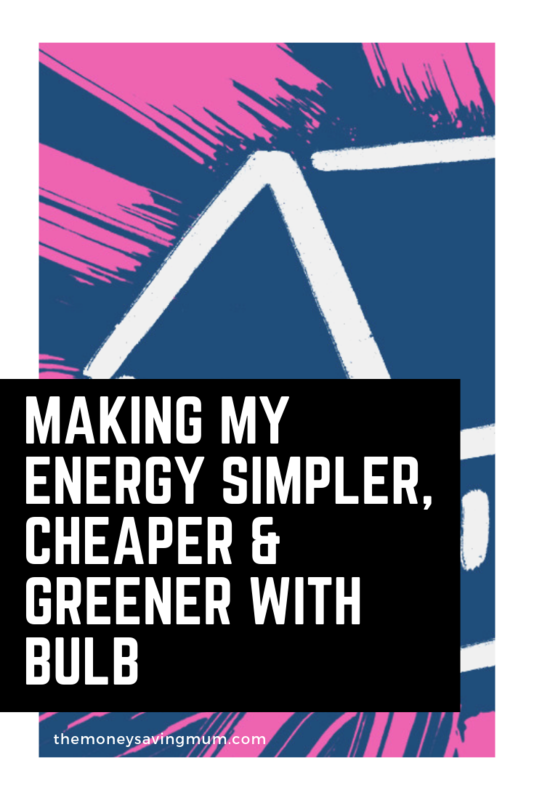 I began my Bulb energy switch at the start of this month from EDF who wanted to up my monthly gas and electricity bill to £125/month! Here is my Bulb energy switch review, how it’s gone and what my new tariff will be! I received my most recent bill around the same time a letter from EDF energy arrive to tell me at the end of September I was due to go on to their variable rate. Doing this was going to increase my monthly payment for both gas and electric to £125/month! I checked the bill and they, as so many energy providers do, had estimated both my gas and electricity usage without even checking themselves or asking me to submit a meter reading. I immediately submitted my ACTUAL meter readings and they altered the amount I owed on my bill by about £50/70. I added all my details into uSwitch, as I now do every year, and found a company that is probably not one of the most popular energy companies. The provider that came out the cheapest was Bulb who told me that my monthly payment would be £30 less than what EDF wanted to charge me so I made the switch! I stupidly thought I was doing the energy companies a favour and actually called EDF to cancel my agreement with them before I pressed to submit and sign up to Bulb. I didn’t need to and was panicking when I thought I wouldn’t have any gas or electric for three weeks! EDF very kindly set my account back up when I realised Bulb would do everything for me and I didn’t need to do a thing! I called Bulb to tell them what I had done but unfortunately I couldn’t get through so I went on chat and spoke to someone who said don’t worry they’ll take care of everything. A week later I received an email apologising that I couldn’t get through and I had to wait and that they would credit me £10 for the inconvenience! How nice was that! Last year I mentioned I had never actually switched energy providers before (shock horror I know!) but I just couldn’t be bothered! Pop your figures into uSwitch and see if Bulb is the cheapest on option for you too. Head on over to their site using my refer a friend link and both you and I will get £50 credit towards our next bill!! Funnily enough EDF called me in the days after the switch had taken place to tell me that they had just released a new tariff and would I consider switching back. I’m all for saving money but as you know I’m also conscious of getting value for money and paying people for what they deserve… unfortunately it was too little too late EDF! Previous Post How to not waste money on Black Friday or Cyber Monday! Next Post 10 fun facts you probably didn’t know about Mickey Mouse | happy 90th birthday Mickey! Pingback: Energy prices & tariffs explained... can you save yourself some money?